Partners in the world’s largest operational agreement between shipping companies have agreed to extend their alliance until 2027. 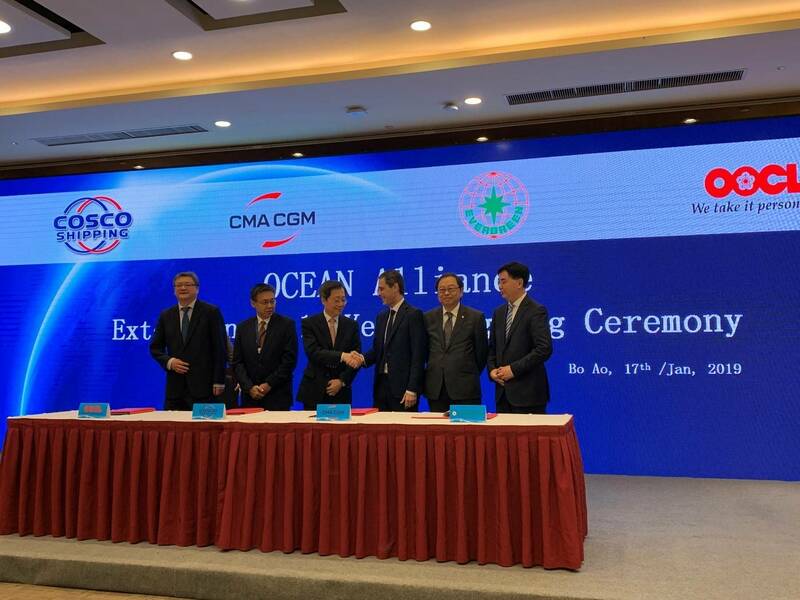 The Ocean Alliance, consisting of CMA CGM Group, COSO SHIPPING, Evergreen and OOCL, was launched in 2017 for an initial period of five years with an option for a five-year renewal. The partners confirmed they will extend to the alliance's full 10-year duration, during a signing ceremony in Hainan, China on Thursday. Partners in the alliance on Wednesday launched the Ocean Alliance Day 3 Product slated to start in April 2019. The new service will include around 330 container ships, 111 of which will be operated by the CMA CGM Group, for a total estimated carrying capacity of around 3.8 million TEU. It will offer 19 Transpacific services, seven services between Asia and Europe, four services between Asia and the Mediterranean, two Transatlantic services, four services between Asia and the Middle East and two Asia-Red Sea services.